A little preparation prior to arriving for your graduation photo shoot ensures your photo shoot will be a joyous experience with magnificent results. As the majority of people tend to book their graduation session on the same day as their ceremony, these simple planning tips are well worth your while. When booking your Auckland graduation photographer, be sure to allow enough time to get to/from your ceremony, especially as with so many other graduates also in the vicinity, travel times can take longer than normal. 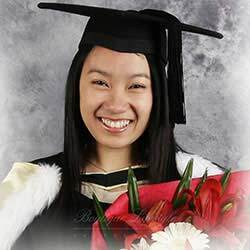 It is best to book an afternoon graduation photo shoot if you have a morning ceremony, and vice-versa, to ensure there is no stress to arrive at your booking on time. Be sure to let us know of your ceremony time so we can allocate you a suitable time on your chosen day. For your convenience, we also offer you on-site car parking at our studio, only a short drive from Auckland’s CBD. In addition to your regalia, be sure to bring along any other items that you may wish included within your graduation portraits. These can include, but are not limited to, flowers you may have received, your certificate (if you have received this prior to your booking) and perhaps any graduation related toys/gifts given to you by friends and family. These can add another dimension to your photos, making them more personal and memorable. You are more than welcome to bring along your family to your graduation photo shoot (there is no extra charge for this), as it is a great opportunity to celebrate your academic achievements with them. We can discuss with you the combinations of portraits you would like to capture, for example your entire family, individual portraits, parents with the graduate, siblings etc. As always, our friendly team will assist you throughout your graduation photography with aspects such as posing and providing advice during your image viewing. Together, this ensures a relaxed and fun-filled experience that is worthy of your achievements. Feel free to contact us with any booking enquiries you may have and we will be more than happy to assist you. Please take into consideration that bookings are made on a first-come-first-served basis, so be sure to book in early to avoid disappointment. And finally, we have many people booking their graduation shoots well after their actual graduation (sometimes years after the fact). By simply bringing along a hired regalia, photo shoots can be held retrospectively, so remember that it is never too late to celerbate!